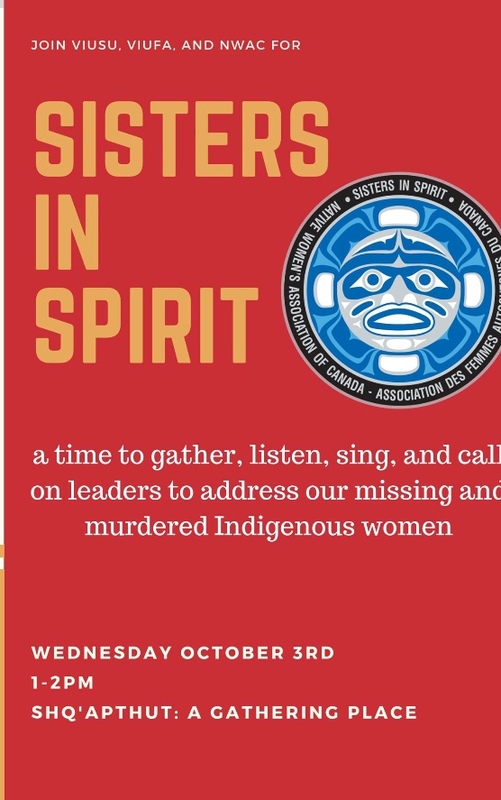 The annual Sisters in Spirit vigil in honour of missing and murdered indigenous women and girls takes place this Wednesday, October 3, from 1pm-2pm at Shq’apthut (A Gathering Place). In solidarity with the vigil and ongoing movements to educate the public about racialized, colonialist, and gender-based violence experienced by indigenous women and girls, the VIUFA Status of Women committee is collaborating with the VIU Student Union and their Women’s representative, Anouk Borris, to participate in the Red Dress project next week. We will be hanging red dresses in the quad area (near the main cafeteria and library) and in select spots around campus to provoke discussion about these issues. Each dress will carry a written message, a statistic, or a relevant piece of information about the ongoing history of this violence.